Lots of limb and tree clearing going on in the neighborhood. Obviously a lot more like what we had. Next street over had an old tree uprooted and fall in the street, blocking traffic. It’s being cleared away as I write this on Wednesday. If you can make out the three yellow spots (click on the photo to biggerize it) you’ll see the broken limbs from a tree on the north side of the rancho. Tool shed visible through the branches. Super-saturation with rainwater combined with 45 mph gusts brought them down. Now to clean them up. May take a few days to get it scheduled with a tree service. “Is it an emergency?” asked the receptionist. “Because we’ve got trees fallen into houses and onto cars.” Well, no. I can wait. UPDATE: Our landscaper got a crew out Tuesday and cleared all this away. Said one good result is the grass will grow better now without the shade. Not at the rancho, fortunately, as we are on the northwestern side of Austin at a higher elevation than most of the rest of the city. But more likely in the downtown area, along Shoal, Waller and Onion creeks, and definitely south and east of I-35: Bastrop, La Grange, Giddings, Kyle, Lockhart. Because as of 1 a.m. Sunday they have had upwards of 17 inches of rain. With much more to come. Wave after wave. Through Thursday. Rain all day, every day. 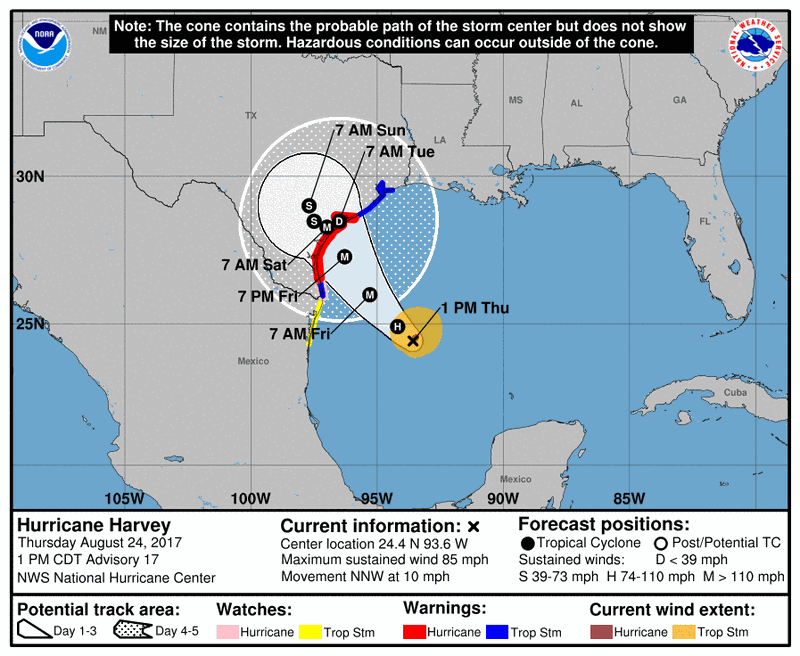 All because Harvey has stalled about 80 miles due south of Austin and is stationary and pulling Gulf moisture up and around Austin. In a counter-clockwise rotation. Like a fire hose. With no atmospheric event to stop it. Houston likewise is being hit hard already. A town where 4 inches of rain causes flooding has, so far, had 15 inches and more. With more to come. 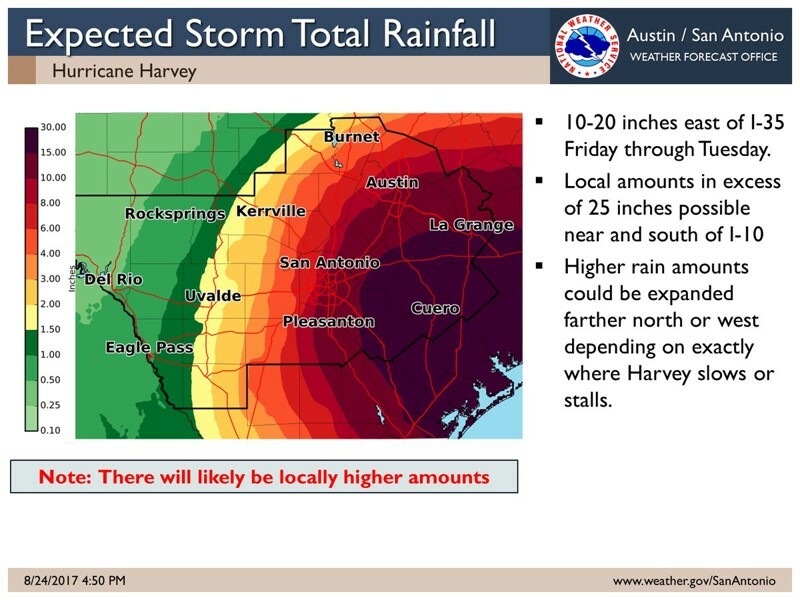 This is as KVUE’s chief meteorologist Alberto Ramon says an historic event. A potentially catastrophic event as the Colorado and Guadalupe Rivers get out of their banks. There’s been nothing like this in a hundred years or more. Power’s been out at the rancho since noon. Just came back on about 6:30 p.m. Charging iPhone and Fire tablets and quick checking the weather radar which still shows lots of yellow rain bands swirling overhead. Training, the weather liars call it. Had about three inches of rain since midnight. Plus the wind is gusting to 20 mph or so now. So I expect we’ll lose power again soon. Doesn’t take much wind speed to knock the power lines down in our neighborhood. Nevermind Harvey. This is the third time this year, second time this month. You’d think the city would want to fix it. You’d be wrong. My theory: There’s not enough minorities live over here to make it worth their while politically. UPDATE: Nothing posted by JD since Friday so he may have cleared out. Andy’s hanging in, but he’s well west of most of the action. He’s sure right about the state planning ahead. No repeats of Katrina here yet or likely to be either. Hell, we bailed out New Orleans and Houston took hundreds of refugees. MORE: Power lost again late Sunday night for a couple of hours. Six to eight inches of rain could fall on the rancho this weekend. A pittance compared to what some others will get but plenty enough for us. These things usually look worst on the approach to the coast, when the weather liars and the bobbing heads sound, sound, sound the alarm. Although that’s pretty low country in the storm’s path. So not surprising Rock Port and Port Aransas are already ordering mandatory evacuation. How many will actually leave, however… Here at the rancho, we’ll just prepare for a lot of rain. And no power. 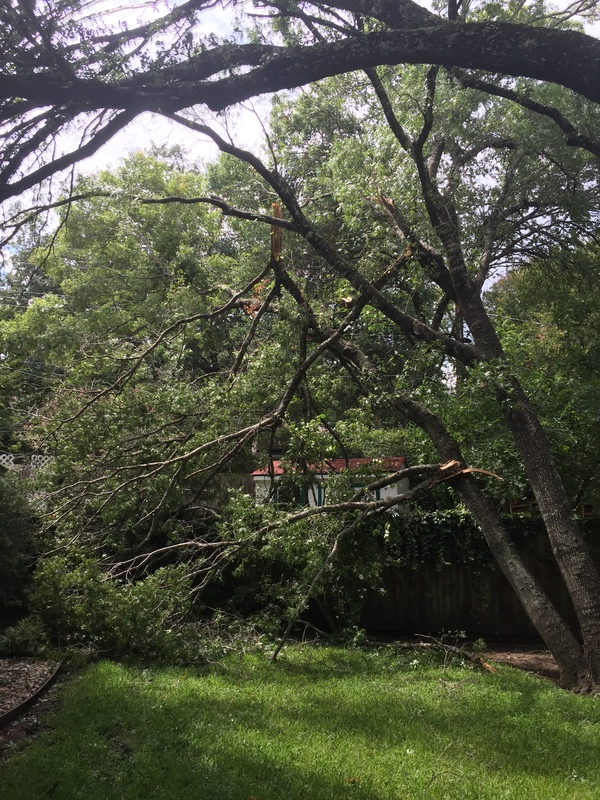 Doesn’t take much to knock Austin’s power out—about which our liberal city council has done absolutely nothing. With too many downed trees, it could be quite a while before the electricity is restored.